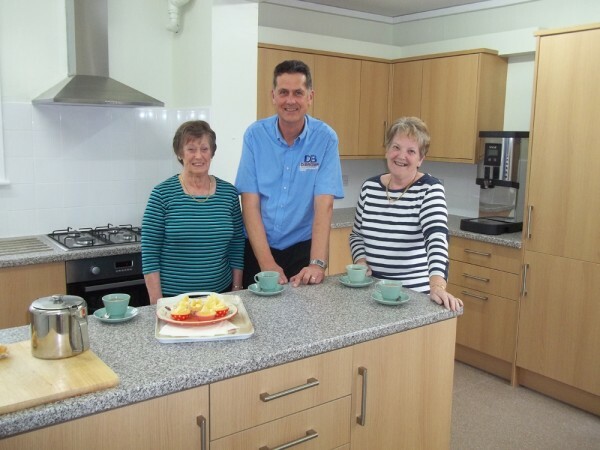 Ladies from Holbeach Women’s Institute celebrated the refurbishment of their new kitchen by inviting the local building company who completed the work to afternoon tea. Representatives from D. Brown (Building Contractors) were delighted to take up the offer of afternoon tea and homemade cakes at the WI Hall in Holbeach on Thursday (16 October). Grant funding from Lincolnshire County Council and ‘Awards for All’ allowed the WI to have their old kitchen completely refurbished and a new energy-efficient boiler installed at the hall in Park Road, Holbeach. The WI ladies had to wait 10 months for the grants to come through and the refurbishment works were completed in four weeks and delivered on time. Peter Pitt, Senior Contracts Manager at D. Brown (Building Contractors), said: “It was a pleasure to work with the ladies of the WI. Pictured at the afternoon tea are (from left): Eileen Holmes (Treasurer), Peter Pitt, Senior Contracts Manager at D. Brown (Building Contractors) and Shirley Wilson (Trustee).